Goal 15: Protect, restore, and promote sustainable use of terrestrial ecosystems. 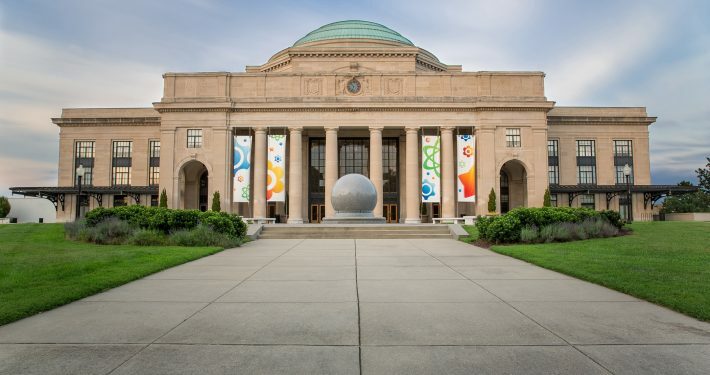 With a core value of environmental sustainability and home to a robust series of programs and exhibits that explore the themes of climate change, environmental stewardship, and energy use, the Science Museum of Virginia, located in Richmond, is well-positioned to bring a new message of resiliency to the Commonwealth of Virginia. Working with climate change and resiliency experts, the Museum has developed a new suite of public programming entitled Learn, Prepare, Act—Resilient Citizens Make Resilient Communities. It delivers new resiliency-themed content, programs, and events that help Virginians understand climate change science on local and global scales, recognize climate change impacts on Virginia’s communities, understand community resiliency, and take personal actions to increase readiness and resiliency. This project leverages federally funded investments at the museum, including a Science on a Sphere platform, funded by the U.S. National Oceanic and Atmospheric Administration (NOAA); the Rainkeepers exhibition, funded by the U.S. Fish and Wildlife Service; and the EcoLab, funded by the U.S. Department of Energy. EcoLab delivers public programming and digital media messaging to help the general public understand climate change and its impacts on Virginia’s communities and give them tools to become resilient to its effects. Home to both the delicate Chesapeake Bay ecosystem and a highly vulnerable national shoreline, Virginia is extremely susceptible to the effects of climate change and extreme weather events. It is vital that citizens across the Commonwealth understand and recognize the current and future impacts that climate variability will have on Virginia’s economy, natural environment, and human health so that they will be better prepared to respond. In collaboration with NOAA’s Chesapeake Bay Office, George Mason University’s Center for Climate Change Communication, Virginia Institute for Marine Science, Public Broadcasting Service/National Public Radio affiliates, and Resilient Virginia, the Museum uses data from the National Climatic Data Center and Virginia Coastal Geospatial and Educational Mapping System to develop and deliver new resiliency-themed programming. This includes presentations for Science on a Sphere and large-format digital Dome theaters, 36 audio and video digital media broadcast pieces, two lecture series, community preparedness events, and a Resiliency Checklist and Certification program. The Museum’s Challenge Lab space is a project-based experience where guests use a finite number of given resources to tackle a science-based challenge. Challenge Lab programming has been a natural fit for exploring renewable energy concepts. Museum educators lead guests through a challenge that encourages guests to apply what they’ve learned about adaptive behaviors and resiliency to create a solution to a problem Virginians might encounter as a result of climate change. Examples include creating a water filter in the event of water contamination or shortage and building devices that can generate energy from alternative sources (solar, wind) in the event of temporary stoppage of electricity due to a severe storm event or grid failure. In EcoLab, guests support the honey bee population by building and placing nest sites for native solitary bees and wasps at their homes. The Science Museum of Virginia also incorporates climate change and resiliency themes into programming in its new Art Lab. Using NOAA data sets, graphs, and imagery as prompts, Art Lab participants create their own works of art on themes of climate change, environment, and resiliency by interpreting data through artistic expression. These works are not only displayed in the lab but also in a digital display dedicated to climate change and resiliency topics. Art is a familiar activity that can be effectively used as a communication tool and entry point for people who think they cannot understand scientific concepts. The Art Lab creates a space for dialogue around difficult issues such as climate change. With the assistance of project partner Resilient Virginia, the Museum hosts an annual resiliency/preparedness community event, PrepareAthon, associated with the America’s PrepareAthon! campaign run by the U.S. Federal Emergency Management Agency. This campaign seeks to prepare citizens for hazards including flood, hurricane, tornado, wildfire, and winter storms–all of which are increasingly impacting Virginians as a result of climate change. During this free event, guests participate in climate change and resiliency-themed programs throughout the museum, meet disaster experts and emergency responders, take part in workshops and activities designed to increase personal resiliency, and receive basic disaster preparedness “foundation” toolkits stocked with supplies. In an effort to encourage museum guests to take further action to increase community resilience by engaging in preparedness and adaptive behaviors at home, the museum and Resilient Virginia have also created a Resiliency Checklist and Certification initiative.